Ph.D. in International Studies is a 3 to 5-year doctorate level degree course in Political Science which emphasizes on International Relations. The minimum eligibility for the course is a Master’s degree (Post Graduate qualification) or an M.Phil. in the respective field of study with a minimum of 55% marks at the undergraduate level. Some colleges provide direct admission to the candidates on the basis of their performance in the Master's degree exam. Some also give weightage to overall academic performance. While in some colleges, an entrance exam conducted by the college/University itself or a relevant common entrance exam is required to be cleared. Ph.D. in International Studies course requires the students to complete research and an entire combination of coursework, under the guidance of a faculty advisor and doctoral committee. Such graduates will become qualified and well equipped with the knowledge and ability to handle work related issues of their domain of study. Funding or fellowship is offered to the students but the students require qualifying CSIR UGC NET to avail the same. Ph.D. students are generally given stipend or scholarships every month. So, the course usually does not cost anything. But still, it can cost around INR 9,250 to2 lacs, depending upon the college/institute of choice. After successful completion of Ph.D. in International Studies course, the candidates can find employment in Diplomat, Research, Teaching, News Industry, Writing and so on. 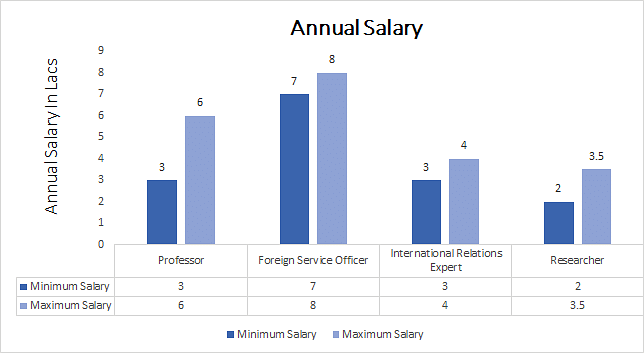 The various job profiles such candidates can lookout for are Foreign Service Officer, News Editor, Blogger International Relation Expert, Lecturer, Researcher, Author, and Professor. The average salary a freshly pass out doctorate candidate can expect is around 2 lacs to 4 lacs per annum, which will increase with experience and expertise. Job Positions Foreign Service Officer, News Editor, Blogger International Relation Expert, Lecturer, Researcher, Author and Professor. Ph.D. in International Studies: What is it About? Ph.D. in International Studies course can be pursued on a full-time basis or through distance education mechanism. International Studies is a domain that deals with specialization in the study and analysis of parameters, factors, and elements which design the relations between various countries all over the globe. The course is structured as such to deliver an in-depth research into the subject as well as all the horizons that the subject might touch. Ph.D. in International Studies students are required to execute research on a specific topic related to their subject as a part of the academic curriculum. The students are also assessed in the terms of their academic curriculum. Thesis/Report submission is a way through which they are assessed in terms of their learning and assessment capabilities and at the same time learn about the subject through fieldwork and practical classes. Due to the enhancement of Globalization, the subject and extent of International Studies have expanded with countries engaging with each other at bilateral, grouping and multilateral level. With respect to this, it has become highly important to have experts and candidates who are well versed and qualified in this subject in order to be able to contribute in managing diplomatic and various other ties of the country. They are required by various organizations to contribute at different stages and levels of functioning. Candidates are required to have passed PG/ M.Phil. examination from any recognized State/Deemed/Private/Central University. Candidates must have secured at least 55% (45% to 50% for reserved category students) aggregate marks at the graduate level. Candidates must not be having any backlogs or compartments in any of the subjects at PG/M.Phil. level, which is yet to be cleared at the time of admission to Ph.D. in International Studies course. Candidates should also qualify the relevant entrance examination like CET. Besides the above criteria, candidates need to qualify other criterions as imposed by the institute they want to obtain admission in. Such postgraduates have ample options to choose their career from. Successful postgraduates of Ph.D. in International Studies course can find employment in Colleges and Universities, Diplomat, Research, News Industry, Writing, Teaching, and so on. The various job profiles such candidates after the completion of the course can look out for are: Foreign Service Officer, News Editor, Blogger International Relation Expert, Lecturer, Researcher, Author and Professor. Ph.D. in International Studies is the highest possible Educational Degree/Qualification a candidate can achieve in this field.